Sutter’s Fort has collected historical material since the Fort was reconstructed in the 1890s. 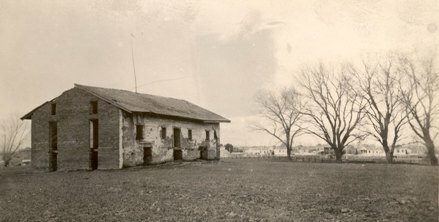 In 1917, the Fort was designated California’s State Historic Museum, and the collection grew for decades. However, in the 1950s the Fort was reimagined, with its new purpose being to give a realistic idea of what life might have been like in the 1840s. Most of the museum exhibits were removed and the collections taken to offsite storage locations. In 2014, the collections were moved to a new, state of the art curatorial facility on the former McClellan Air Fort Base. This facility is called the Statewide Museum Collections Center (“SMCC”). The collection of Sutter’s Fort State Historic Park does include information about John Sutter and the development of the Fort, but its real strength is the material culture of immigrants to California in the 19th century. The collection includes furniture, housewares, tools and equipment, portraits, photographs, diaries, letters, maps, business records…and more. Access to the collection by researchers is by appointment only. Curatorial staff is extremely limited; at least a month of advance notice is recommended. All research appointments take place at the SMCC, not at the Fort itself. The Curator will respond to research questions as time permits. The largest portion of the material in the Martha J. (Patty) Reed Lewis Collection was collected by Martha J. “Patty” Reed Lewis (1838-1923), a survivor of the Donner Party tragedy, and was donated to Sutter’s Fort by her daughter’s estate in 1946. Most of the material collected by Reed-Lewis concerns the business affairs and personal experiences of her father, James Frazier Reed (1800-1874) and the events of the Donner Party tragedy. This collection spans the period from 1826 to 1951. Types of material in this collection include correspondence; business records; legal documents; certificates, announcements and minutes pertaining to James Reed’s membership in the Masonic Order; and correspondence, ledgers and lists relating to his role as the agent for U.S. Pensions for the State of Illinois prior to his departure for California. Also included in this collection are recollections, notes, journals, scrapbooks, printed material, ephemera, artwork, publications, photographs, tintypes, ambrotypes, daguerreotypes, news clippings, maps, and drawings. The DeWitt Clinton Thompson Document and Photograph Collections cover the lives of General DeWitt Clinton Thompson, his wife Marion (Brown), son Clinton Leavenworth, and daughter Marion. The material was collected by daughter Marion Thompson and spans the time period 1786 to 1940. General Clinton DeWitt Thompson distinguished himself by recruiting members for the California Hundred and the California Cavalry Battalion, whose men served in the Civil War. Thompson accompanied the latter group as commanding officer when it went east to join the Massachusetts Cavalry. After the war Thompson became prominent in San Francisco real estate, brokerage, and banking. Although much of the collection concerns her father’s affairs and is rich in Civil War material, Marion also preserved her own personal papers, including diaries and correspondence, which meticulously detail her life in Victorian San Francisco. The Margaret A. Kelley Document Collection consists of documents pertaining to the James W. Marshall Pioneer Museum in Kelsey, California founded by Kelly and dedicated June 24, 1921. Kelly was a lifelong friend of James Marshall. This collection also contains George Barklage’s compilation of Wells Fargo documents; Asa Thurston Heydon’s correspondence from his adventures in the Klondike; and also Margaret Kelly’s personal correspondence and papers from her teaching career. This collection spans the time period 1856 to 1941. The Captain John Washington and Ellen Antoinette Bagley Family Papers, 1853-1903 consist of original documents, certificates, of commission, a Muster Roll and miscellaneous correspondence related to the Russian River Rifles Co. (B) 13 Regiment, 2 Brigade, of Sonoma County, and ephemera. Captain John Washington Bagley was discharged from the U.S. Army in 1853 then served as Commanding Officer in the Russian River Rifles Co. (B) 13 Regiment, 2 Brigade for the State of California in the 1860s. This unit was based in Healdsburg, California. The Captain Cyrus C. and Mary Steele Bitner Family Papers, 1859-1917 consist of original Civil War documents and pension records from the units with which Captain Bitner was associated. The Bitners also kept various types of documents such as household papers, newspaper clippings and editorials which give a glimpse into the family’s many interests. The Pierson Barton Reading Collection contains correspondence, lists, and historical documents pertaining to P. B. Reading’s life as a young man, his stay at Sutter’s Fort, and as an early settler in California. The John and Annie Ellicot Kennedy Bidwell Papers, 1844-1916, concern the Bidwell’s business dealings and everyday lives 1844 to 1916. The collection consists of letters, business papers, receipts, ephemera, newspapers, programs, photographs, and rare books. The Sutter’s Fort collection contains 1,800 photographs including images of early pioneers, California locations, and the Fort site. The images are indexed by the sitter’s or subject name. There is also a section of photographs featuring unidentified people. This online finding aid is a comprehensive guide to all Donner-related materials within the Sutter’s Fort collection. It includes a history and timeline of the Donner Party; a reference to Donner information in the general Archives files; the complete finding aids for the Martha J. (Patty) Reed Lewis Collection and the Charles E. Davis Overland Trail Project Collection; and an index to the Charles E. Davis Overland Trail Project Collection photographs.